The Air Force Marathon has officially sold out all races. So what’s next? Organizers have announced details for a transfer program, which is now “the only official way for runners to give their [running]bib to another runner,” according to Rob Aguiar, the race director. So essentially, if you don’t wish to run anymore, give your spot to one of your friends. “Along with the charity partner slots, it is the only way for someone not currently registered to secure a spot,” he said in an Air Force press release. The transfer program will open July 22 at 9 a.m. EST and run through August 1 until 5 p.m. EST. Runners who wish to transfer their bib will be able to register on the Air Force Marathon website and will be given a special code. That code will allow another nonregistered runner to register under that person’s bib. Costs for the transfer program vary for each race and charges will apply for the person transferring into a race. The Air Force Marathon’s nine charity partners also have limited full and half marathon spots available. More information on fundraising requirements and the charities are available on the website here. 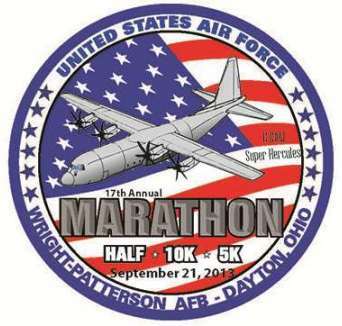 The 2013 Air Force Marathon is Sept. 21 at the National Museum of the U.S. Air Force. The 5K is Sept. 20 at Wright State University’s Nutter Center.The Sports and Fitness Expo will also be at the Nutter Center Sept. 19 and Sept. 21.